My mother-in-law is the cookie queen. Especially at Christmas. Every year, disinfection I look forward to the massive tupperwares filled with all kinds of cookies. But my favorites are always, here always the Candy Cane Cookies. These are the ones I sneak in the morning before breakfast, after breakfast with my coffee, as a mid-morning snack… You get the picture. They’re simple shortbread-style cookies flavored with almond extract and covered in crushed candy canes and powdered sugar. They look they’re nestled in a snowdrift. They get all over your nice black pants. They’re simply awesome. These cookies have been a tradition in Tom’s family for years and I know I’ll be including them with my own traditions. Do not double this recipe. I’m not sure why – but that’s the note in my mother-in-law’s recipe and I dare not mess with it. I did want to make more that the recipe yielded, so I made 2 batches – one with red food coloring and one without. That seemed to work just fine! Preheat the oven to 375° and line a cookie sheet with parchment. Whisk the flour and salt together until evenly mixed. Set aside. 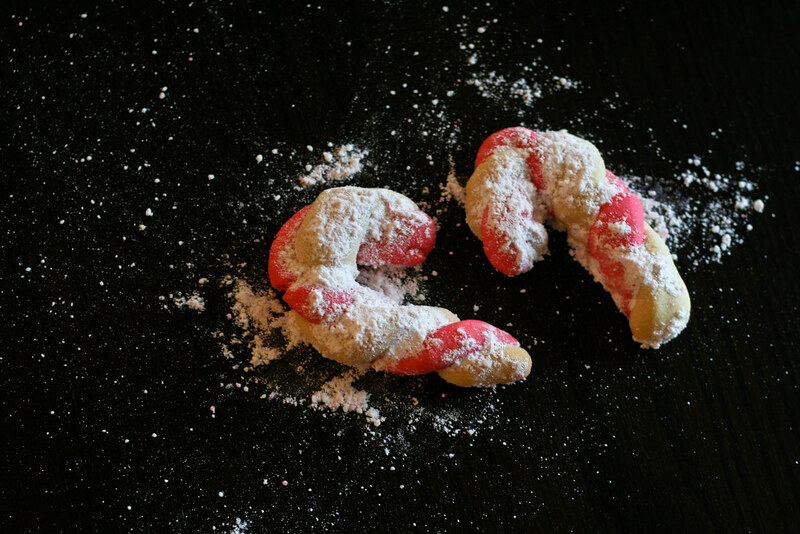 In a food processor, crush the candy canes until they form a fine powder. If you don’t have a food processor, place the candy canes in ziploc bag and use a rolling pin (or wine bottle, or vase, etc.) to crush them into a fine powder. Whisk together with the 1/2 cup of powdered sugar and set aside. Using an electric mixer fitted with the paddle attachment (or a big bowl and a whisk), beat the butter until light and fluffy. Add 1 cup of powdered sugar and beat until combined. Add the egg, almond extract and vanilla extract and beat until well-combined. If you’re making two batches, add the food coloring to one of the batches only. If not – wait! Slowly stir in the flour mixture until well combined (you can use the “stir” setting if you’re using an electric mixer). If you’re making two batches, you should have one red batch and one uncolored batch. If you’re making 1 batch, divide your dough in two and add the food coloring to one batch until well-combined and uniformly red. At this point you should have one batch of red dough and one of white. Pinch off a little ball of dough of one color and roll it between your hands to form a thin cylinder that’s about 4 inches long. Do the same with the other color. Carefully twist the two colors together and form a candy cane. It might take you some time to get the hang of it, but they’ll taste great either way! Place each candy cane on your cookie sheet. Continue forming cookies until you use up all the dough. Bake for 9 minutes. Remove from oven. While the cookies are still warm, sprinkle all over with the crushed candy cane and sugar mixture. They should look like they’re covered in a pile of snow. Lovely cookies – so perfect for the holidays!! We’ve got a chance to try them at AgencyNet, they were incredibly delicious. I have been making these cookies for more than 30 years, so I know why you don’t want to make a double batch — the dough may dry out before you get it rolled out into the cookies, and then it’s a mess to try to roll! You could probably double the recipe if you had a lot of helpers to roll out them out (I recruit my daughters). This is a holiday favorite, for sure! Yum! My mom makes these at christmas. Always one of my favorites.